First time I sa w TERMINUS by Mark O’Rowe was because I kept hearing endorsements. People kept saying that if I ever get a chance, I shouldn’t miss it. Few month later I saw that it was coming back. My expectations were high, naturally. So let me tell you about my experience. Three characters, three lives concerned with and consumed by events of just one night. Each has a unique story to tell. They are so different, that sometimes you wander if they even live in the same time, space and universe. You are taken on three journeys simultaneously as they unfold themselves in front of your eyes. They capture you each in their own way. It’s dark, it’s violent, it’s captivating. There is love and there is hate. It consumes you entirely. On the back of my head I kept trying to connect characters on stage, but failed miserably, until they did it for me. It was expected and unexpected at the same time. 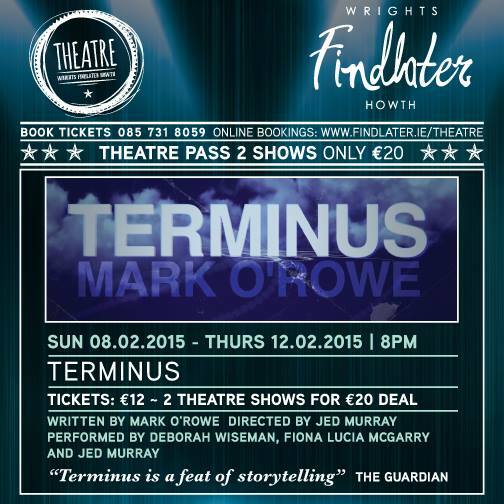 Just as everything written by Mark O’Rowe, TERMINUS leaves in a state of shock and admiration. Wonderful cast of ABC Theatre Company and a well thought through production takes you somewhere you’ve never been before. If you get a chance, do go and see it. Be warned however, you have an emotional journey in front of you. Dates: FEB 8-12 @ 8pm! Reblogged this on Stoneybatter Presents.